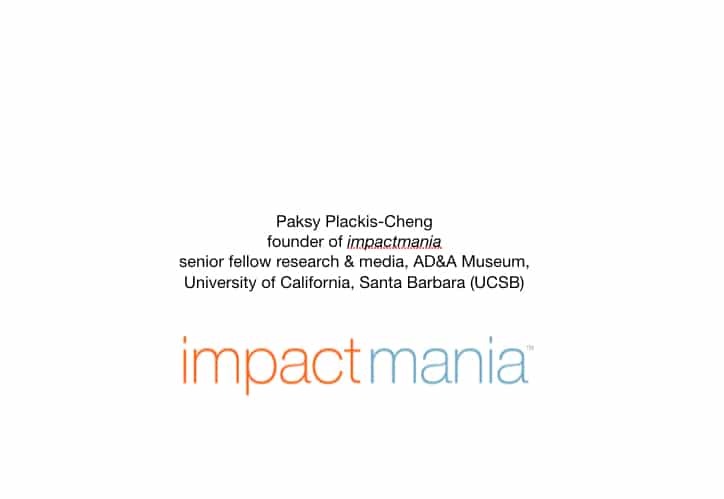 I am the founder of impactmania and a Senior Fellow at AD&A Museum, UCSB. impactmania has a partnership with the AD&A Museum, UCSB. Who studies Art History, Anthropology, Sociology? Have your parents been concerned of you pursuing a degree in the arts and humanities? For who is this their last year at UCSB? Do you know what you career you are pursuing? Who is anxious about the future? Who is afraid of these guys? Are these guys taking over our job, and our world? 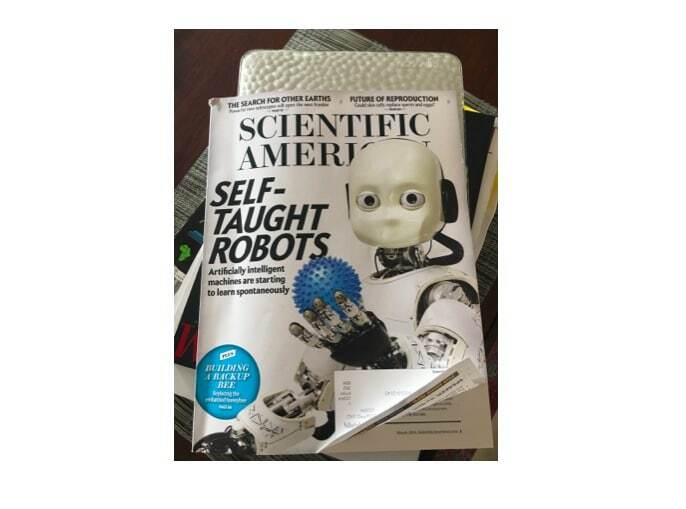 You do know that robots now can write newspaper stories indistinguishable from humans? Who has seen the following statistics? Initially, I found these numbers alarming. Now I look at these and am excited. These numbers also mean there will be many new opportunities. 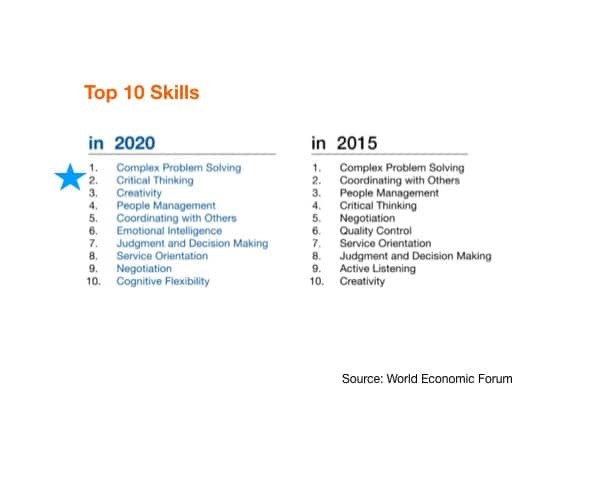 We’ll need Chief Productivity Officers, nano-medics, robot-counselors (matching people w/ robots), 3D body part makers. Apart from wealth mangers, you will also have crypto-currency managers. But also non-technology jobs such as a nostaligst: someone who recreates familiar living places for the elderly. There have been pilots in senior homes in the Netherlands and it has shown that people with Alzheimer reengage with family members in a recreated setting that reminds them of their old home. 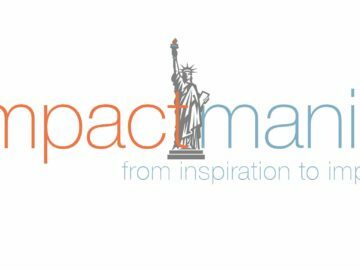 Talking about design with impact! 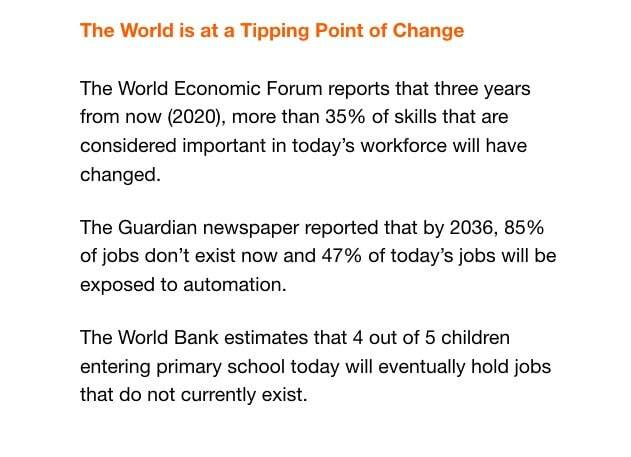 How do you prepare for the future of work impacted by a continuous stream of disruptive technologies? I asked MacArthur Fellow educator and founder of a STEAM (science, technology, engineering, art, and math) Academy, Amir Abo-Shaeer. He answered: “By working on open-ended projects.”Abo-Shaeer went on to speak at the White House about education. Interviewing him and more than 300 other impact makers across 30 countries, I have heard: Be flexible. Collaborate. Stay curious. And be a lifelong learner! 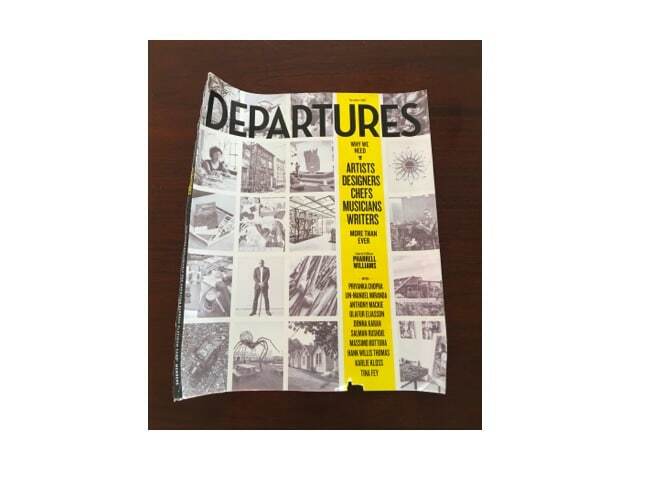 Because we also read this, right? This is me. And then, I still left out a bunch of random and odd summer jobs I’ve had. Most people have no idea what they want to do, most end up in careers they had no idea of or knew existed. They take turns in their lives that change their perspectives. Can you imagine my surprise taping (yes, on a tape recorder) my first interview with my dad at age 6 or 7, is basically what I am doing now. The faster you figure out what makes you tick, and what you are about, the better. Although, I do not regret any job I ever had in my life, and am grateful I have been in industries from high tech to performing arts, working in a 12+ countries, and have been in small startups to mature public companies, it has been an ever challenge that doesn’t stop. I have interviewed a two time Emmy award winner composer, and he is still stressing about where his next gig is coming from. Master your talent; expose yourself to what forms your trade. I heard most often during interviews: “I learned by doing.” I urge everyone to spend time in other parts of the world. At least spend some time in another part of this amazing country, if possible as a (short-term) resident. Find your unique value proposition, what sets you apart from the person who is seated next to you? Or that awful business term called networking. I use tribe here, it sounds more soulful, but don’t be tribal, which would actually set you off on the opposite direction. You need a core team you can trust and rely on: people who have your back. A group of people that is less transactional — more relational. 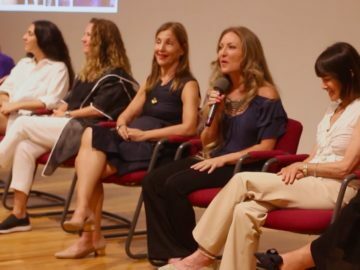 Especially those who are masters in their fields, try to connect with people who are not like you, don’t think like you — older, younger, mix of social-economic background. Yes, even those with different religious backgrounds. Spend time with your tribe, work with your tribe, and most importantly support your tribe. You will have to put in your time. There is no get-rich/famous/successful — fill in the blanks — scheme. You get up, do your work, and repeat. You will have to take calculated risks, you will have to listen, but also learn to ignore voices: the one in your head, the one from your parents who are anxious for you. Ignore voices from random disengaged people who are jealous, bitter, negative, you name it. Put in the hours. And even then, there is no guarantee. But you will be exposed to ideas, people, options, and therefore creating opportunities for yourself. You will figure out why you are here. 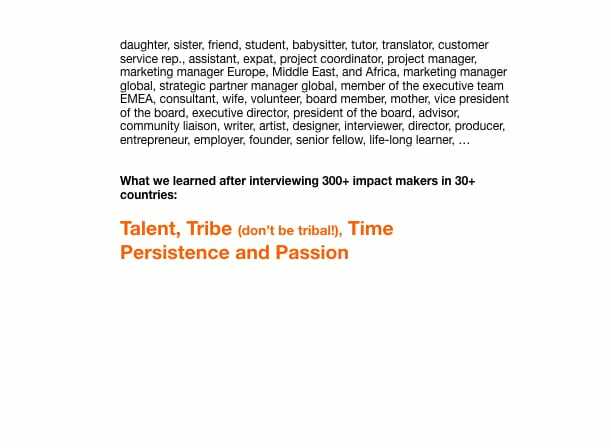 Here is an opportunity for you to put in some time, talent, and start building your tribe. 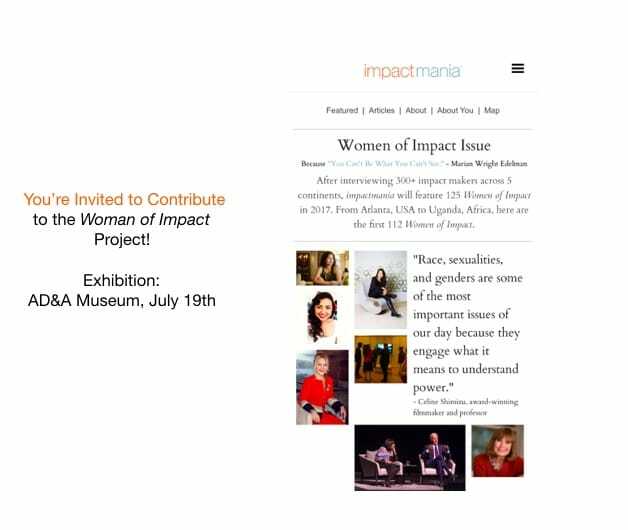 An invitation to add your voice to impactmania’s current project, which will launch with a panel and exhibition, July 19th – September at AD&A Museum, UCSB. After the launch, we are planning to take Women of Impact to other places. 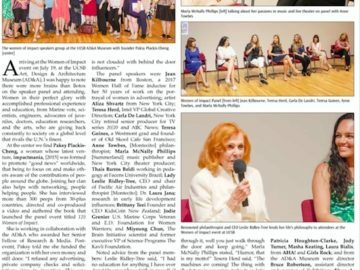 Marirose’s interview is on the homepage, and will be part of the book and exhibition, July 19th. She is working on a second interview. Nicollette and Zoe are in the midst of interviewing. Tyler will edit an interview w/ an upcoming AD&A Museum artist. And they will all contribute to the exhibition as well, for example, Zoe is working on a video loop we are presenting in the Museum. 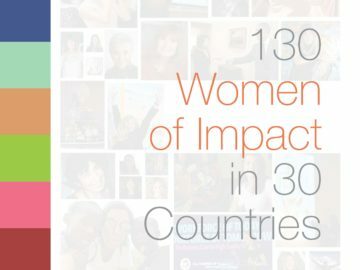 I’d love for you to interview one Woman of Impact. It involves researching someone in a field you are passionate about who is driving cultural, social, or economic impact. Connect and interview this person. Speak w/ the interns who are part of the project or contact me for more info. 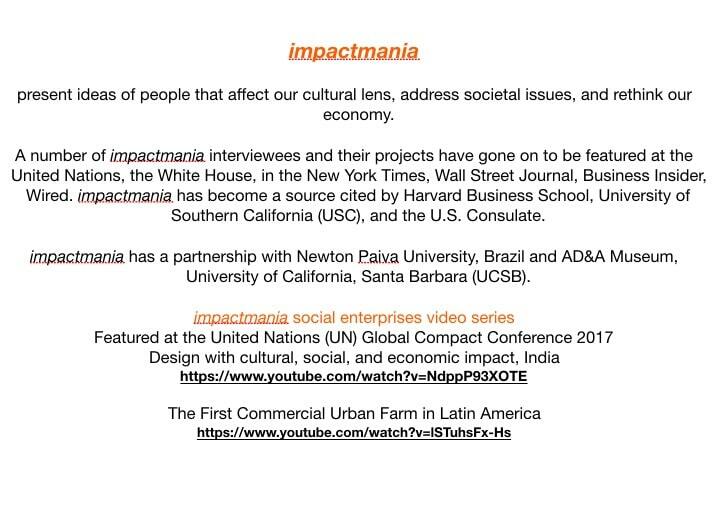 Through impactmania interviewing people from all over the world, I was invited to direct and co-produce a video story in India. The video subsequently was featured at the United Nations Global Compact Conference 2017 and led me to attend the UN General Assembly week. It also led me to an interview at the UN Studio. I would never even think of half the things I ended up doing, I believe strongly that one thing will lead to another. You have to just take that first step and not fret too much about what the future brings.